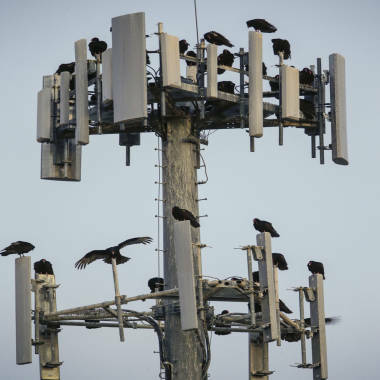 A cell phone tower above downtown Beatrice, Neb., is a resting spot for buzzards in April. In a major victory for the Justice Department over privacy advocates, a federal appeals court ruled Tuesday that government agencies can collect records showing the location of an individual's cell phone without obtaining a warrant. The 2-1 ruling by the 5th Circuit Court of Appeals in New Orleans upheld the Justice Department's argument that "historical" records showing the location of cell phones, gleaned from cell site location towers, are not protected by the Fourth Amendment. A key basis for the ruling: The use of cell phones is "entirely voluntarily" and therefore individuals who use them have forfeited the right to constitutional protection for records showing where they have been used, the court held. "The Government does not require a member of the public to own or carry a phone," wrote U.S. Judge Edith Brown Clement in an opinion joined by U.S. Judge Dennis Reavley. The opinion continued: "Because a cell phone user makes a choice to get a phone, to select a particular service provider, and to make a call, and because he knows that call conveys cell site information ... he voluntarily conveys his cell site data each time he makes a call." The issue of cell phone location data has become a major and increasingly contentious battleground in the privacy wars. Privacy advocates argue that the proliferation of cell phone towers in the U.S. – 285,561, according to the latest industry records, more than double the number 10 years ago – and new technologies, such as smartphones, permit law enforcement agents to track highly sensitive information about where individuals have been – their homes or trips to see doctors, friends or lovers – without making a showing to a judge that there is "probable cause" that a person has committed a crime. Instead, police and law enforcement agents have been obtaining such records under a law called the Stored Communications Act by asserting that there are "specific and articulable facts" showing the records are needed for a criminal investigation – a lower standard. The debate has even touched on the National Security Agency's surveillance program: Director of National Intelligence James Clapper last week wrote a letter to Oregon Sen. Ron Wyden stating that the agency has "no current plans" to collect cell phone location data as part of its bulk collection of phone records. But Wyden, a Democrat, has repeatedly asserted that the agency has the legal authority to do so, noting in a recent speech that "most of us have a computer in our pocket that potentially can be used to track and monitor us 24/7." Tuesday’s ruling involved three cases in which unknown federal agencies applied for 60 days of cell site location data in three criminal investigations. But it is hardly the last word on the subject. The 3rd Circuit Court of Appeals has already ruled that federal judges may require warrants for such data, and the ACLU and other privacy groups this month filed a brief to the 4th Circuit urging that warrants be required for all such government requests.